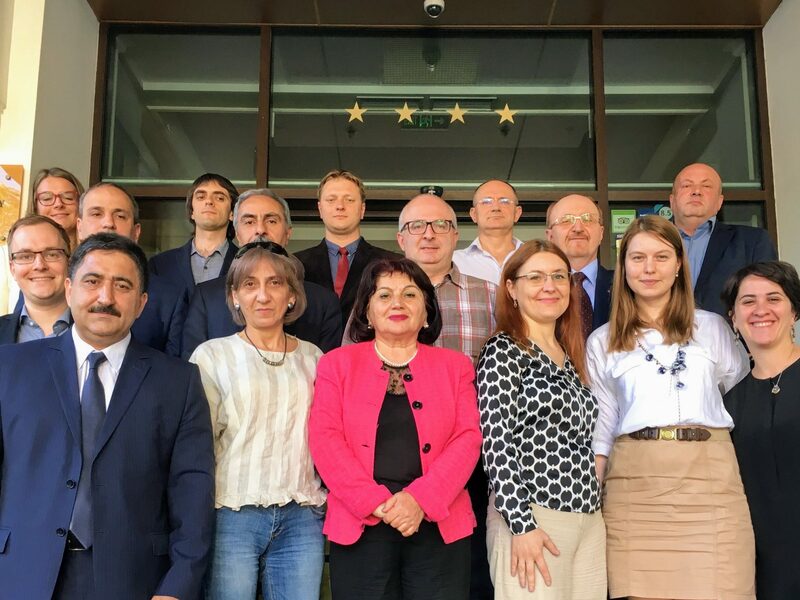 On 6-8 June, the Eastern Partnership Civil Society Forum Working Group 2 “Economic Integration & Convergence with EU Policies” held its annual meeting in Chisinau, allowing for meetings between the 17 representatives of the EaP CSF WG 2 and several external local stakeholders. The meeting was opened by WG2 coordinators Dovile Sukyte and Yurii Vdovenko and continued with coordinators of the National Platforms, all summarizing developments and challenges in their respective countries. Often mentioned topics were SMEs development, digital reform and agriculture. The divide between countries adopting the DCFTA and the rest of the EaP countries was underlined several times and, together with it, the difficulties in making recommendations for the whole region. Georgeta Mincu (Centre for Development and Management) then provided an overview of the EaP CSF policy brief, a document offering the civil society perspective on the Joint Staff Working Document “Eastern Partnership – Focusing on key priorities and deliverables” and she covered the deliverables falling under WG2 priorities. Deputy Prime Minister for Reintegration Gheorghe Balan opened the meeting with Moldovan stakeholders. Balan underlined how, despite of the difficult economic situation and budged cuts, the economic revenues are increasing and the economic results are better than envisaged by IMF. He also described the unresolved conflict in Transnistria as one of the biggest challenges for the country. However, Balan emphasized how the government is attempting to move away from the military component of the peacekeeping mission, favouring instead the civilian component, which would provide ground for reconciliation and dialogue. Following Balan’s intervention, Mihaela Gorban, Head of General International Economic Cooperation Directorate, Ministry of Economy of the Republic of Moldova, delivered a comprehensive presentation about the benefits and challenges of the DCFTA’s implementation. Tatiana Molcean, European Integration Department, Ministry of Foreign Affairs and European Integration of the Republic of Moldova, commented on the challenges for the Eastern Partnership as such and emphasized the need for more synergy between the efforts of the civil society and the national governments. Finally, the last session was dedicated to internal discussions regarding the new EaP CSF strategy, the Alternative civil society declaration and the EaP CSF Annual Assembly that will take place on 25-27 October in Tallinn this year.